I've done the "Spring" wing of Park City already, so here's two more seasons, if you will. Above is the "Summer" wing, below, obviously, the "Winter". Not the greatest scans, I know, but I'm working on getting better shots. As well, whenever I find a shot of the "Fall" wing (don't have it yet), I'll repost them all, together, in one entry (the 4 seasons), so we'll finally have a complete Park City retro set! For those not in the know, this mall has a rather distinctive design layout, with one central "hub" court in the middle, and 4 "spoke" sections radiating outward from there. In the early days of the mall, these wings were kind of themed, and named after the four seasons. Pretty cool idea! I've added a current map from their website (to the left) so you can see the unique layout. In addition, it was mentioned in the comment section of another Park City entry here, that this mall also included, again in the early days of its life, these swanky "TV Pod" installations in each wing (or "TV trees", as someone referred to them). You can actually just see one in the first "Summer" shot above, off in the distance. So check out these closer shots of 'em! Finally get to see these things! And it's pretty cool, huh? Very futuristic looking. Many thanks to MOA reader, John, for sending the two TV Pod shots you see here! This is some good stuff. I had to blow them up considerably, though, so with these, too, the quality is lacking. But I'll seek out better versions for sure. For those who may not have been from the area, Hamburgers was not a restuarant, but a clothing store specialing in mens (and I think perhaps women's) dressier clothing. We had them in the shopping centers in Baltimore -- I forgot there was in Park City as well. Serramonte Center in Daly City, CA, currently uses the Spring, Summer, Winter, and Fall wing concept. The mall is setup to be Feng Shui compliant. There were only a few malls where each wing or building of the mall had a 'theme' or name attatched to it. No malls here with that cool 'spoke' layout though. That had to be way ahead of its time back in the early 1970s when the mall opened. How did Kohl's get in there? I'm guessing this was the basement where the mentioned ice rink used to be. Anonymous: I'll try to scrounge up some pix of the arcade and rink for ya. Scott: Thanks! Didn't know any current mall was still using that concept! Kind of cool to know. Matt: Yep, someone in the comments of one of the other Park City entries did say that the old basement area has been turned into the Kohl's now. So that may be it. Thanks, Bill since I wasn't completely sure that my faulty memory of Hamburgers as a clothing store was correct. And as the anonymous commenter correctly points out the basement contained an arcade, the skating rink and a TV station. Most of this space was eventually reconfigured (and my faulty memory kicks in again, since I didn't live there then) for a Clover discount store, I believe which was there prior to Kohl's. There was in fact a Clover at the mall before Kohl's. I haven't ben to it, but I've passed by Park City a few times and know a little about its history. I didn't know about the TVs though. That was truly awesome. Anyway, the TV station was in the location below the escalators that take you from the lower level near the Kohls entrance (used to be Clover) to the upper level where the back entrance to Woolworth's used to be. There are community classrooms and mall offices at the top of this escalator now. I think the TV station was WLYH or WGAL, I can't remember. Kohls now occupies the space where the rink and arcade was. There is a food court now in the other section of the basement area where the other set of escalators were (I remember a hair salon used to be behind the escalators in the old basement area). 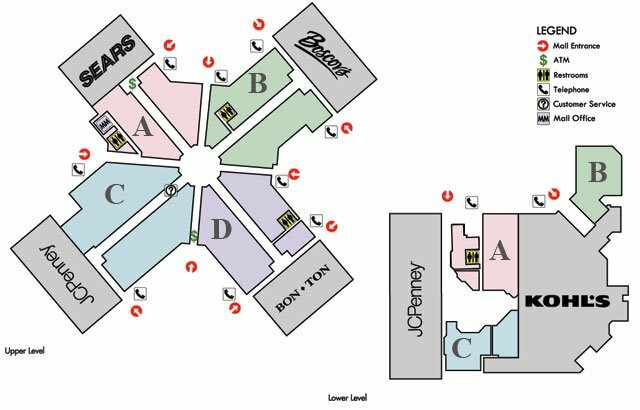 The basement entrance to JCPenny's was not there originally, but was added during the previous renovations. Currently, the mall is under another renovation and has switched to a new brighter decor. Not a big fan of super bright malls... I really liked the moody, dark setting of the old basement area. It just gave the place so much more character. I would appreciate seeing any shots of the old basement area. Thanks Keith! Can anyone tell me if the main anchor of Park City is still in operation, namely Watt & Shand? Love the vaulted ceiling design and the futuristic look of those TV sets. You can almost imagine them booming out propaganda messages a la "Big Brother is watching you" in some old SF movie. The four seasons concept sounds really cool. And I've always loved the idea of ice skating rinks in malls. I remember seeing one in Houston in the late 1970s. Another mall using this concept is Puente Hills Mall, in The City Of Industry, CA. Its famous for being the mall used in Back to the Future. Today, the mall has lost almost one wing to big box stores. The TV Pod thing nearly creeps me out to see! Renminds me of the clunky computer mall directories Southwyck and the defunct North Towne (both in Toledo, Ohio) had to get in the '80s that often had a TV set on the other side playing CNN or something. Nice Shots of the Park City Communications TV pods! I worked on these for many years. Park City Communications shared space with TV Facts and WLYH-TV CBS 15. The mall was designed and wired with the TV station in mind. WLYH could go live from any part of the mall. The spokes were all wired with video and audio return lines which went to a large patch bay under the fountain. That fed the studio. WLYH had a microwave system back to the transmitter/studio in Mt Gretna. There was a morning show (Good Morning!) which originated from the mall and was live at times during the early days of the mall. 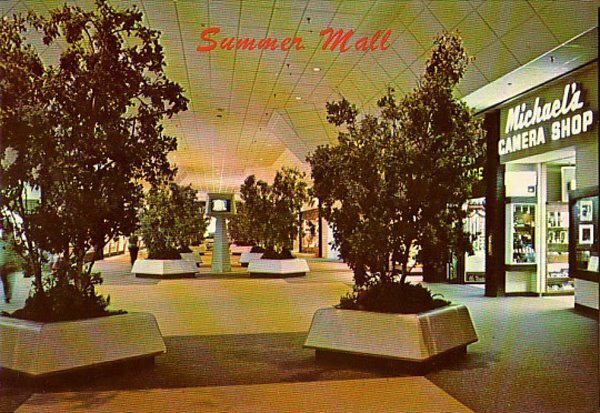 Later, an hour of programming aired from the mall via tape each day. The studio was also the Action News bureau for York and Lancaster reporters. There were several audio systems throughout the mall. The main system had the same audio as the TV's while another subscription service provided background music to stores and offices. There were many zones, so the audio could be lowered or turned off for special events. The TV's also were used for breaking news, such as CBS Special reports when President Reagan was shot, the last episode of MASH and ACTION NEWS 15 aired at 6pm. People surrounded the monitors during these times. Thanks for the info Randy! I only wish some station had the nerve to do that in one of my city's malls. As far as the TV Pods are concerned...I was actually AT the mall the day that Ronald Reagan was shot. I remember it like it was yesterday...I was coming up the escalator and everyone was crowded around the TV pods watching the local news broadcast as they announced that the president had been shot. I guess they say that everyone remembers what they were doing when they heard that Kennedy was shot (if they were alive) and I will always remember hearing the news of Reagan's assassination attempt while I was at Park City Mall. Great to see the old photos. I remember the Clover, the Ice Rink, and of course..the arcade. I also remember the flea market next door. I went back to PA about 4 years ago and saw that there is a big food court down below. Thanks for the photos...brought back some great memories of days past....wasting away as a mallrat. Wow, this brings back memories! I don't remember that the wings of the mall had season themes. My friends and I were also there the day Reagan was shot. We saw lots of people gathered around the TV pods so we had to see what was going on, too. In addition to the ice skating rink, arcade, and flea market in the lower level, there also was a movie theater at one time. And when the mall first opened there was also a small indoor miniature golf course. I was in 2nd grade at the time and my class went to Park City for a field trip and to play miniature golf there. However, I got the chicken pox and couldn't go that day. Gimbel's was one of the original anchor stores. In the 80s it became a Pomeroy's and then a few years later was bought by Boscov's. Boscov's is still there today. Watt & Shand was another original anchor store. It was one of two Watt & Shand stores, with the original store being in downtown Lancaster. I believe it was in the '90s when Watt & Shand was sold to Bon Ton. The Bon Ton remains at Park City but the downtown Lancaster store was closed. One other thing about the basement of Park City; in the very early days of the mall, it included an amusement park. There was even a very small roller coaster, obviously very small, as the ceilings were so low. I don't think the amusement park lasted very long at all; maybe just a few months in fact. Does anyone remember the big Mafia shooting? I think it was in the late 70's or early 80's. It was at a Pizza Place called "Italian Delight" in the Gimbel's mall. Apparently the pizza shop was just a front for a mafia drug ring. If their food didn't kill you, the Goodfella's will hahah! 1. Jade Tiki Inn - This was the place to go to get served alcohol if you were under 21. 2. Fitness America in the lower level. They were in trouble big time for selling lifetime memberships and then going out of business. 3. The infamous Game Room in the lower level. Does anyone remember PINBALL???? Back then it only cost a dime! 4. The flea market. After Ice Skating and Roller Skating failed to attract people, they turned it into a flea market. What a dump! 5. The X-Rated Movie Theaters!I'm sure Lancaster County was happy to get rid of that! 6. Arrow Shoes - Mom took me there to get school shoes. Buster Browns! Oh, the good ole days when Park City had a roller skating rink, (turned flea market), and a video arcade where teenagers hung out and mingled. Now teenagers are seen in small groups with cell phones hanging out of each one of their ears, (not even talking to the friends at their side, (mostly girls). What social progress!!! Let's see if Park City survives the oncoming freight train of economic recession/depression, (perhaps they should reconsider lending out cheap space to those who want to hold flea markets again!!). Whiskey, Barrels and Rhyme --- commonly called Barrels. It was dark and rustic with rough finish tables and chairs made out of barrels. Lighting was very dark also. Good place to meet the group or the husbands after shopping. thanks for the great shots of the hub,or center of the mall. i loved all the old photo's , great memories from that era. some of the best times of my life were spent at that mall. not sure the amount of money i spent on models ,but at one time that mall had 3 hobby shops in it . toy-bar allied and k.b.toy and hobby . all were large well stocked stores.i guess computer games killed all that, kids don't build stuff any more. I grew up at park city mall lol, circa 1975-78. the replaced the ice rink with a roller skating rink, which was packed every friday night. At the bottom of the escalators, was a hair cutting place called Great Expectations. across from that was the arcade. sylvan pools also had a store down there. if you went the back way out of the skating rink and up the stairs, you could go right into a pub called barrells,wiskey and rhyme. Wow... Some Great posts. I remember the miniature golf course, the "electric go-cart" track, and the Funshop (I believe in Gimbles Mall), which had practical jokes in the front and a magic shop in the back. I, unfortunately, also remember working with a guy who had too much to drink at Jade Tiki and took a dump in one of the toilets during a home builders show... He may have been the3 original Jackass, Nice! Thanks for posting! I worked at Provident Bookstore in 1985-86 (first in the Penney's mall and then we moved to the Bon-Ton mall...the new store was painted in pink and teal). I remember watching the Challenger space shuttle disaster on one of those TV pods. There was a McDonald's in the mall back then; I used to get the McDLT. Thanks for the memories! -Thanks for this site, I had forgotten about so many of these stores. 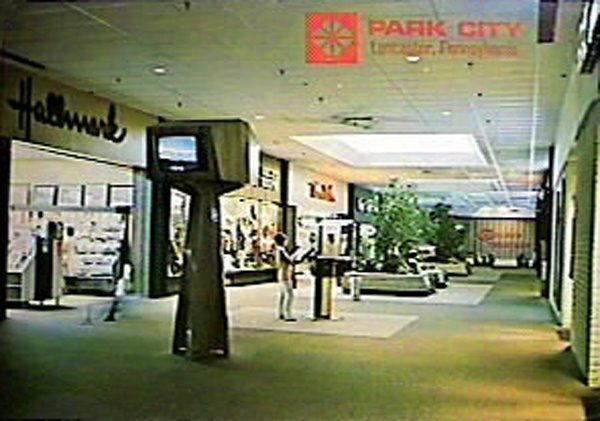 I remember reading or being told back then that Park City was the first mall in the WORLD to have closed circuit televisions. I remember there being a place shoppers could take their kids so the kids could watch the tv. a few years later in Toronto I saw this tv and kids space taken to another extreme where they had a whole kids area you walked past that was like a plastic treehouse club thing with closed circuit tvs...so the idea caught on at least in Canada. I think at the time of its construction Park City was also the largest enclosed mall in the world, but of course that didn't last long. The arcade downstairs was the first time I ever saw a VIDEO game--it was PONG! I had the privilege to hand out at Park City during its very first months open and so I really enjoyed this blog. Just wanted to add a couple things that go back to that time. Of course you could smoke openly in the mall, there huge ash trays in the walk ways. My mother taught ice skating at the rink and I played ice hockey there as well. I was glad someone else remembered the swimming pool dealer. They had actual swimming pools built in the store. I think it had a wood cow fence around it. Before the amusement park was built there was only Bumper cars and the arcade sported the very first PONG game in the area.I dumped many coins in that game. There was a head shop in the mall called FAR EAST and you could buy any kind of pot smoking invention there. I remember the smoke shop was among the very first stores in the mall and it is still there. Also, MERRY GO ROUND and DAVEY JONES LOCKER supplied my Disco Shirts. My first job was in the Pensupreme shop located outside of Watt and Shands. The mall opened with only that wing of the shopping center completed. I met my future wife at the amusement park,the part that held the electric (slick track go kart track) which was cutting edge for its time.She worked at the ball toss. The memories are so vivid. I am from Lancaster, and the arcade was dark, as one of the posts mentioned. There was also a movie theater by the now Kohl's. It turned into an adult theater later in the 70's. The rink also (if memory serves) was also turned into a roller rink. There used to be a back entrance (stairs) that connected one of the smaller mall spokes into the rink/arcade area. The Clover store I believe was owned by Strawbridge and Clothier from Philly. That closed, as well as Strawbridges. Watt and Shand closed several years ag0 (along with the Downtown store). The Bon Ton company (from York PA) bought the WS stores. The only kept the PArk City Mall open, then changed the name to Bon Ton. I remember the Tv's and the glass that you were able to look down to the skaters. The rink was changed to a flea market and then closed. I went to Franklin and Marshall from '76-'80 and spent many hours at the mall. Had a hot date at the Jade Tiki Inn and still remember the song they piped in through the mall...."Eat, drink. Everything nutritious. Jade Tiki Inn will always be, everything delicious." Wish remembering Chaucer had been so easy. I remember all this. Good times! I'm a life-long Lancaster County resident. I'm so glad I came across these pictures! 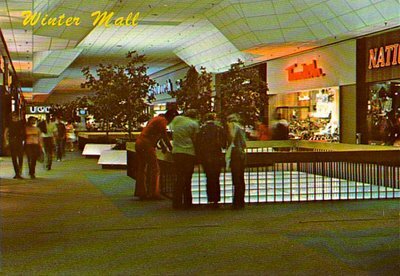 My earliest memories of the mall is the dark brown tile floor, the McDonald's, Woolworth's, and Clover. I don't recall seeing the skating rink, so it may have been converted to the food court by then. As nostalgic as I am, I'm glad they renovated it to brighter colors. I grew up in lancaster and I remember going to park city with my parents and my sister. I've read most of the posts but I remember a pizza place that was connected to the mall and you could watch them make the pizza and throw the dough in the air. There was a window where you could watch from in the seating area. I think. Anyone remember the name of it? It's driving me nuts that I can't remember. 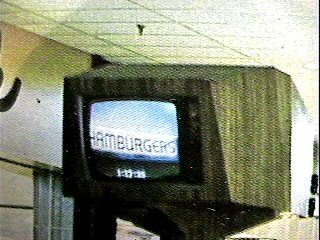 I don't remember the tv's but I remember clover, watt and shand and lots of memories, the mcdonalds and I think I remember people walking around smoking cigarettes inside the mall and the trash cans had ashtrays on them, or maybe that was in my imagination, I was was between about 3-7 in the mid 80's. Enjoyed reading all of these great stories and memories. Things have changed so much. The fellow who made the sculpture at Park City was Stan Lipman. He made it from copper tubing. He called it "The Phoenix." Looked and sounded neat for a few years until it began to leak. I taught school with Stan at nearby Manheim Townshp High School. He was always in my shop asking for help with something. He often would melt aluminum in the furnace and then pour it onto the floor which he covered with sand. Did come up with some neat things. I have a few lawn sculptures which he made. Stan was a fantastic scuba diver and he and Smokey Roberts were good friends. He died way to early! I thought it was a rolling skating, not ice skating. What was the name of the Pizza shop in the mall where there was a shoot out? Also, was there ever a amusement area with a small roller coaster?